As a child, I mourned greatly the death of my great-grandmother, who died on my thirteenth birthday. Later, my grandmother, who died a few months before I married; and then my other grandmother, who shared the joy and anticipation that my wife and I felt at expecting our first child, but never lived to see him born. Just recently I have mourned the death of another man, who, although we were not close, meant more to me than he probably ever realised. Now, as the warmth of summer slips into the coolness of memory, and another autumn begins, I find myself mourning the living. I find autumn to be a bittersweet time of year. 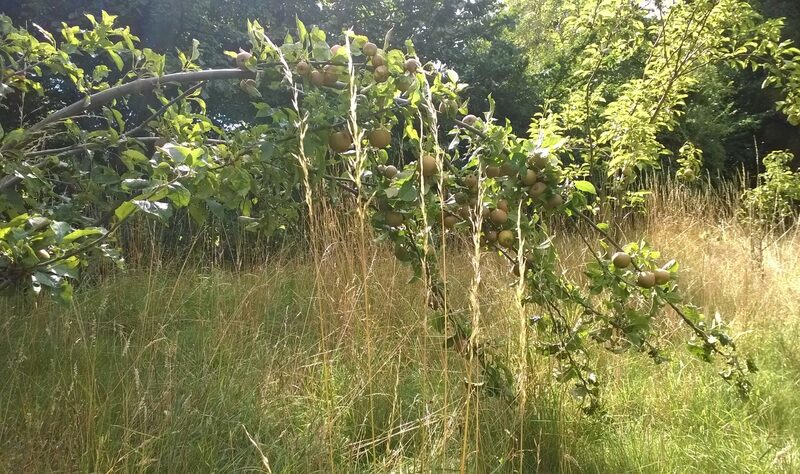 The heat of the sun has gone, and the leaves are falling, yet the apple trees are sagging low under the weight of their fruit, and we are picking wild blackberries and watching the squirrels store their acorns in readiness for winter. The children are returning to school, beginning new adventures and leaving me to my morbid thoughts. Sorry about this. I’m not in the habit of dwelling on such things, but I’ve been feeling a sense of loss recently and I want to externalise those thoughts – to package them into a bundle and expel them as words on the page. It’s a coping mechanism, but also a desire to give my feelings a degree of permanence, even as I move on from them and leave them in my wake. You see, the turning of the seasons has made me realise just how much I have lost of my early memories. The more that my life is lived, the more of it that has irretrievably vanished. Most of my life, I would guess, has now slipped from view. All that remains is a collection of peaks and troughs, partly concealed, hidden from view, steadily losing intensity and gaining in fallibility through disuse. My earliest memory is a fabrication, I believe, constructed retrospectively, partly from an original imprint of a moment that must have been special in some way, but also from photographs, seen later, and used to embellish the stored sensation. I am a baby, and in a pram, one of those huge old-fashioned ones that looks like it ought to have been used in the 1930s, not the swinging sixties. It is a bright sunny day, as the past always seems to be, but it is not summer yet, because I am wrapped excessively in blankets and possibly some kind of bonnet. It may even be winter, as the air seems crisp, and the light has that magical quality of sun in winter. My mother is smiling at me, and saying something, perhaps my name, although who knows? She is very young and dressed fashionably for the time, like Jackie Kennedy, although I can only know this fact with hindsight. My father is impossibly young and handsome, like a kind of James Dean figure, but a happy one. He looks on, proudly, although no child could be aware of that, so this must, as I say, be a fabrication, a reconstruction. Those people are gone now: the rosy baby that was me, now a father in my own right, and not a young one, but well into middle age; the doting young parents, who are now in their seventies and look and behave differently to the people in my memory. Who knows why this moment was preserved in time for almost fifty years? Nothing of any significance seems to happen. Why this fragment of time, and so few others? Sorry to burden you with such ramblings. I just needed to pause quietly for a moment. Now, it is time to move forward once again. Life must be lived, not just remembered. This entry was posted in Life and tagged Death, Happiness, Memory, Writing. Bookmark the permalink. Beautifully written, poignant, and evocative of my own past. A lovely article. I know exactly what you mean about losing the past and how some of your “memories” are composites made of things people have told you about when you were young. There are things I remember more in the stories I’ve related than in the actual events. But then the real trick is in looking forwards, not backwards. The tone of this post is so different from your others, but that’s good. I like the slightly down Steve as much as I like the more hopeful one. I am prone to nostalgia and melancholy so I can relate to your feelings. I have lost too many people recently, but I find that these losses improved instead of lowered my outlook, because these people lived long fruitful lives, bringing me joy and comfort. They are my models, and it seems to me that the best years of my life are to come based on how happy they seemed in middle and old age. I hope you find comfort in the memories, even if it is tinged with sadness. As a teenager I was depressed much of the time. I learned then that we have the power to choose happiness, although for many years, the lure of negativity always pulled me back. There have been things happening in my life recently that have threatened to draw me back into self-destructive thoughts. Instead, I choose happiness. Nostalgia has a lure about it, but it’s best not to dwell on the past too much. The present and the future matter more. I am glad to hear of your improved outlook, Elizabeth. I hope that your own writing continues to help. I personally find that bundling up unhappy thoughts and putting them on the page helps to free me from them. And paradoxically, the more public one can be about this, the better. No need to apologize, this is your space to ramble, and obviously you needed to get this out of your system somewhat. It’s only in recent years that I’ve come to appreciate just how much we forget, or how subject to modification are the memories that do survive. A few years ago, my cousin and I were talking about an event that had happened in our college years. Shortly afterward, we found a video of that event, and were stunned by how poor our memories of it had been, or by how astoundingly different we were back then. Yes. Here’s a thought – was it your memories that were at fault, or was it the way you had interpreted the event at the time? I wonder if we are actually much worse at interpreting the world than we believe we are. But as my worldview, my understanding of reality, changed over the years, the memories remained, but the underlying patterns they linked to changed under them, altering the result of retrieval. When I finally was able to compare the descendant memories to an objective recording of what had happened, the differences were laid bare. Very good piece Steve. This is different for you, but like everything you write it gets me thinking on many levels. It also brings me back more to the sort of thing you usually write about. Why does our memory work like this? Can we change this in the future? Should we? Is it just to big a part of what it means to be human at this present time? Being human is a process, but does this process have a threshold whereby to great a rate of change breaks the continuity? Thanks for a great post! Thanks, Edward. Memory is a fascinating subject, I find. It doesn’t work at all like computer memory, but that’s not really a surprise. It’s not literal, and is just as likely to encode emotions and feelings as actual sensory impressions. I find that location is a very strong trigger for memory – when I visit certain places, I am always reminded of the same thing, which is not necessarily an event that occurred at that location! I imagine that we could enhance memory in the future through AI. I imagine memories stored in the cloud, in much the way that we currently store memories in our brains. Perhaps we could also store literal data in addition, such as text, images, video, of specific events. Perhaps we could even annotate our sensual memories with text at a later date, or cross-reference memories. As you may have gathered, I’m a fan of augmented intelligence in preference to mind uploading and similar ideas. At the same time, it can be usual to forget certain things. Perhaps voluntary deletion of painful memories might become an option at some future point. Who knows?